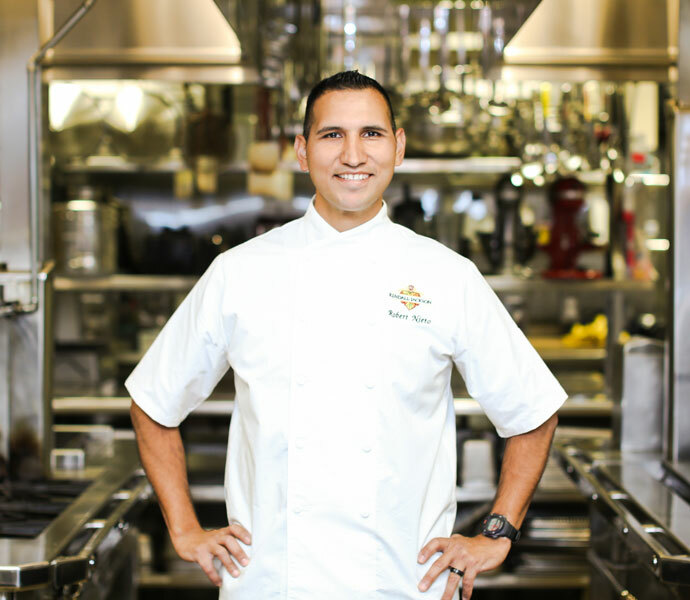 Robert “Buttercup” Nieto first realized he wanted to be a chef while watching ‘Great Chefs’ on the Discovery Channel. At the time, he was planning to go to school for criminal justice, but after seeing a pastry chef on the show create a very intricate plated dessert, he knew that this was what he really wanted to do. Prior to joining the Kendall-Jackson team in 2012, he had never considered working in the wine industry. However, he soon discovered the unique joy that comes from dreaming up a successful wine and food pairing. Over the course of his career, Buttercup has competed in a myriad of pastry competitions. In 2013, he was selected for tryouts by Bread Bakers Guild of America to compete in Viennoiserie and Artistic Design. In 2015, he competed at Pastry Live in the Chocolate Bon Bons, Plated Dessert, and Championship Showpiece categories. That same year, he also had the privilege of being selected as a finalist for the Valrhona Chocolate Chef Competition (C3). In 2016, Dessert Professional Magazine selected Robert as one of the Top 10 Pastry Chefs in America. Recently, he was selected as an assistant to help the USA Pastry Team during the January 2017 competition at the Coupe du Monde de ‪la Patisserie in Lyon, France. On his days off, he spends much of his time preparing for competitions. He is also a triathlon enthusiast. On the job, he is passionate about transforming ingredients into desserts. Ensuring that the desserts he creates pair well with the wines can be challenging, but he enjoys the process of testing the pairings to find the ideal balance. Buttercup’s favorite pastry on the menu at the Kendall-Jackson Wine Estate and Gardens is the Canelé de Bordeaux, and his favorite pairing is a dessert with hints of coffee, chocolate, hibiscus, and chicory, paired with a port wine.